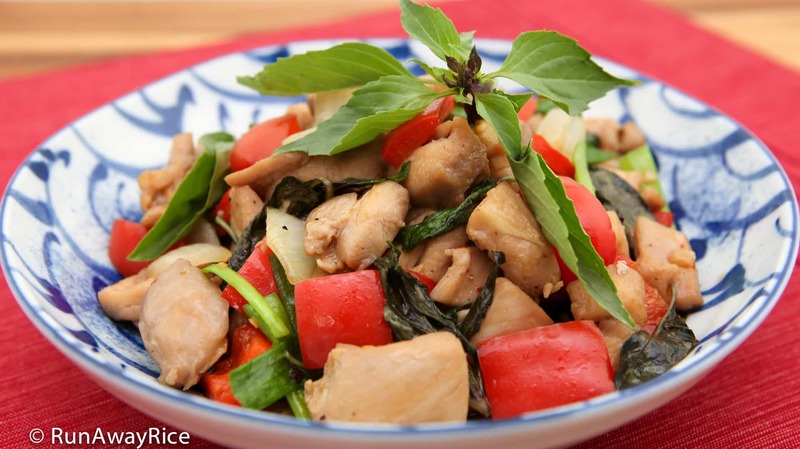 This easy recipe for Thai Basil Chicken (Ga Xao La Que) makes a delectable chicken dish with red bell peppers, onions and fragrant herbs in 30 minutes or less. Quick to prep and easy to cook, it’s a wonderful option for a busy weekday meal. 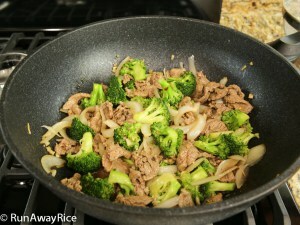 Stir-frying is such a convenient cooking method–it’s fast, simple and healthy. The cooking is quick because everything is typically cooked over higher heat. There’s a bit of timing technique with stir-frying, but with a little bit of practice, it’s a cinch. Also, everything goes into a single wok or skillet so that means less stuff to clean. The end result is a delicious and healthy home-cooked meal in no time at all. Enjoy! I like chicken thighs for this recipe because the meat is juicer. Chicken breast works great too. This is a really versatile dish. Use the vegetables and meat or meat alternatives you like. Try this recipe with fish (like Mahi Mahi) or shrimp for a delicious seafood version. Substitute the bell peppers for eggplant, zucchini, squash, broccoli for more tasty options. Thai Basil leaves wilt and get brown spots rather quickly. If you’ve purchased the herb and not making this dish for a few days, store in a produce bag and keep cold and dry in your refrigerator. Optionally, store in an air-tight container. When ready to use in this dish, wash and trim the herbs. Washing ahead may cause the herbs to wilt. Also, the herbs don’t have to be perfectly fresh for this dish which makes it great for using any leftover Thai basil from other dishes. 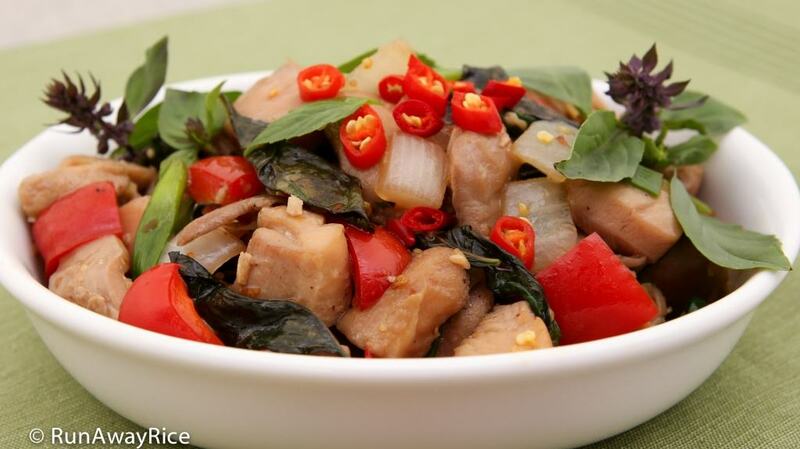 If you’d like a spicier Thai Basil Chicken dish, add fresh chopped red chilies or add chili paste to the marinade. Fiery hot and delicious! Core the red bell pepper. Cut the pepper into strips and then into bite-sized pieces. Cut the yellow onion into wedges and then into small chunks. Separate the green onion root from the stems. Cut the stems into 1-inch sections. Set all the vegetables aside for now. Cut the chicken thighs into strips about 1-inch thick. Cut the strips into bite-sized pieces. In a medium bowl, add the cut chicken, 1 Tbsp oyster sauce, 1 tsp fish sauce, 1/2 Tbsp minced garlic and 1/4 tsp crushed red pepper flakes. Toss together combining everything well. Heat a medium wok over High heat. Add the vegetable oil and remaining 1/2 Tbsp minced garlic and stir-fry quickly for 15 seconds. 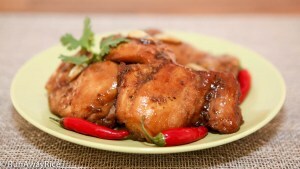 Add the chicken and stir-fry quickly for 1 minute, searing the outside of the chicken. 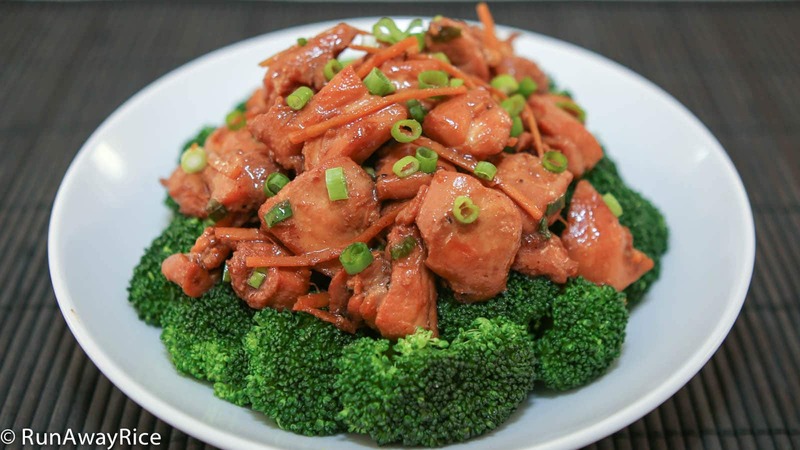 Reduce the heat to Medium and continue stir-frying the chicken until it’s no longer pink inside, approximately 4-5 minutes. Add the red bell peppers and onions and toss together. Season with 1 Tbsp oyster sauce, 1 tsp fish sauce, and 1/4 tsp crushed red pepper flakes. Combine together and continue cooking for 2 minutes. Turn off the heat. Add the green onion stems and Thai basil. Toss together gently. Add ground black pepper. Transfer to a large serving plate and garnish with more Thai basil. 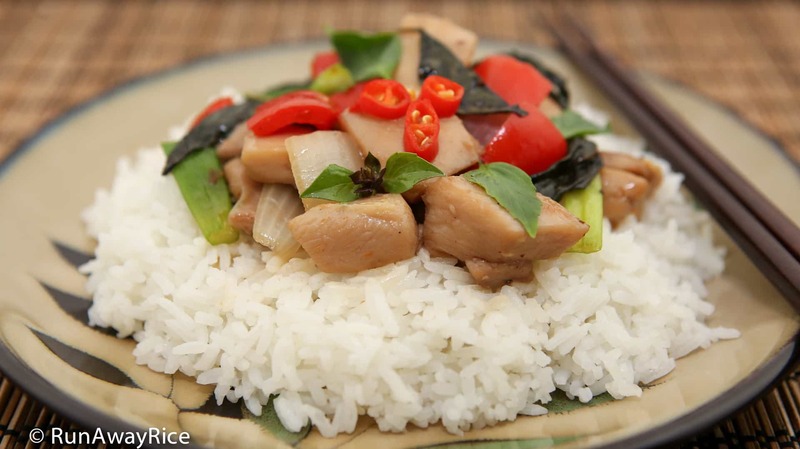 Serve the Thai Basil Chicken with white or brown rice for a tasty and healthy meal. Want to learn more about Thai Basil and other Vietnamese herbs? 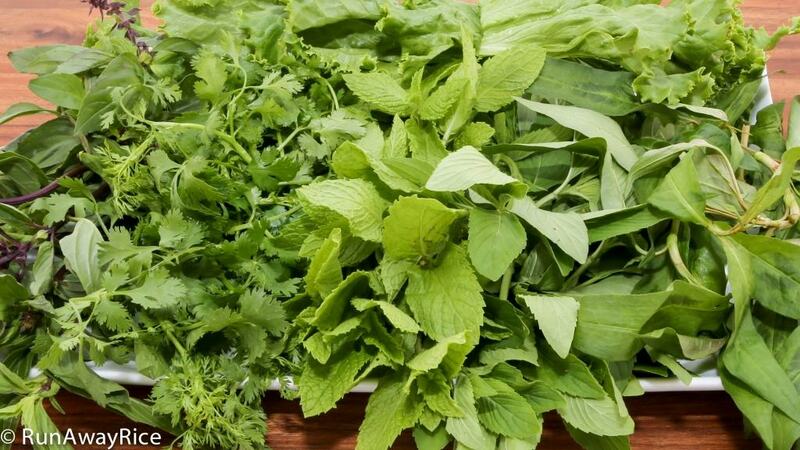 Check out this post for a Quick Guide to Vietnamese Herbs. 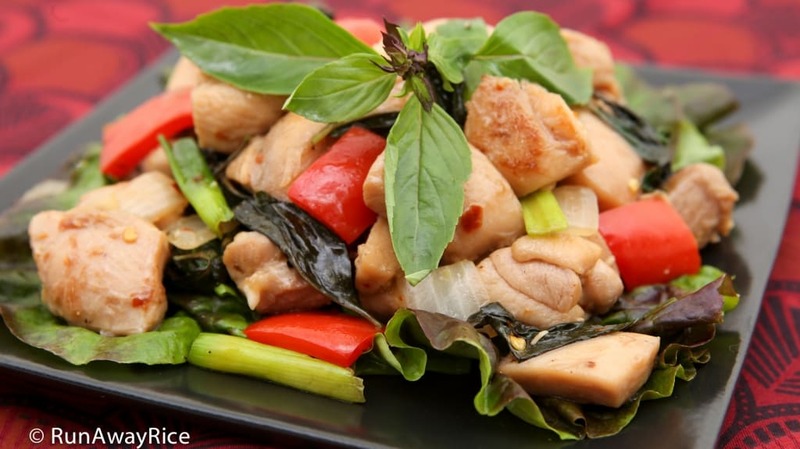 This easy recipe for Thai Basil Chicken (Ga Xao La Que) makes a delectable chicken dish with red bell peppers, onions and fragrant herbs in 30 minutes or less. Quick to prep and easy to cook, it's a wonderful option for a busy weekday meal. Heat a medium wok over High heat. Add the vegetable oil and remaining 1/2 Tbsp minced garlic and stir-fry quickly for 15 seconds. Add the chicken and stir-fry quickly for 1 minute, searing the outside of the chicken. Reduce the heat to Medium and continue stir-frying the chicken until it's no longer pink inside, approximately 4-5 minutes. Add the red bell peppers and onions and toss together. Season with 1 Tbsp oyster sauce, 1 tsp fish sauce, and 1/4 tsp crushed red pepper flakes. Combine together and continue cooking for 2 minutes. Transfer to a large serving plate and garnish with more fresh Thai basil. Serve with white or brown rice for a tasty and healthy meal. Use the vegetables and meat (or meat alternatives) you like. Try this recipe with fish (like Mahi Mahi) or shrimp for a delicious seafood version. Substitute the bell peppers for eggplant, zucchini, squash, broccoli for more tasty options. Thai Basil leaves wilt and get brown spots rather quickly. If you've purchased the herb and not making this dish for a few days, store in a produce bag and keep cold and dry in your refrigerator. Optionally, store in an air-tight container. When ready to use in this dish, wash and trim the herbs. Washing ahead may cause the herbs to wilt. Also, the herbs don't have to be perfectly fresh for this dish which makes it great for using any leftover Thai basil from other dishes. If you'd like a spicier dish, add fresh chopped red chilies or add chili paste to the marinade. Fiery hot and delicious! Thank you Trang for the great idea, my chicken come out very delicious. Chicken is a favorite in my house and so I had to give this recipe a try…so yummy and easy too. I made this dish in the time it took to cook rice. Perfecto! 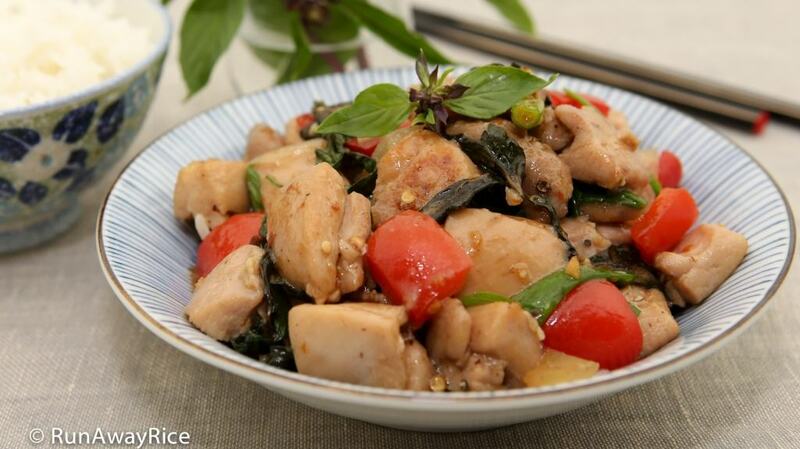 I have the basil plants for phở and bánh cuốn only, and I did not think of using it in this yummy chicken stir fry. Thanks for the great idea! My pleasure! I always have abundant Thai Basil leftover too so it’s a great way to use it up. Enjoy!